A Terrifying First Vision | A Song for the Horse Nation - October 29, 2011 through January 7, 2013 - The National Museum of the American Indian - Washington, D.C.
For many Native peoples, the first sight of a horse was terrifying. 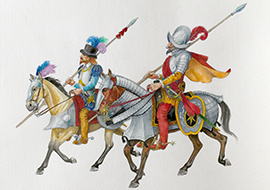 A Spanish soldier on horseback seemed to be a single monstrous creature. The Spanish used this terror to advance their conquest, sometimes attaching bells to their armor to add more noise and confusion. In the islands of the Caribbean, Taíno people were the first to see the horse, and the sight inspired fear—animal fused to sword-wielding conquistador—the legs of the rider blending with the galloping extremities of his mount as it rode down Native people, while the metal of rein and bit and stirrup clanged with the fury of war. Spanish conquistadors of the 16th century. Winfield Coleman. As interpreted by the National Museum of the American Indian.